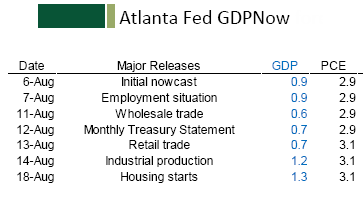 A 15% boost in motor vehicle assemblies added 0.5 percentage points to the Atlanta Fed GDPNow Forecast for 3rd quarter GDP. The GDPNow model forecast for real GDP growth (seasonally adjusted annual rate) in the third quarter of 2015 is 1.3 percent on August 18, up from 0.7 percent on August 13. The forecast for real GDP growth increased from 0.7 percent to 1.2 percent after Friday's industrial production release from the Federal Reserve. Most of this increase was due to a 15.3 percent increase in seasonally adjusted motor vehicle assemblies in July that boosted the forecast of the contribution of real inventory investment to third-quarter GDP growth from -2.2 percentage points to -1.8 percentage points. Motor vehicles added 0.5 percentage points to the forecast and today's housing starts numbers added another 0.1 percentage points to the forecast on August 13. First quarter GDP came in at 0.6%, second quarter at 2.3%, and the 3rd quarter estimate is 1.3%. 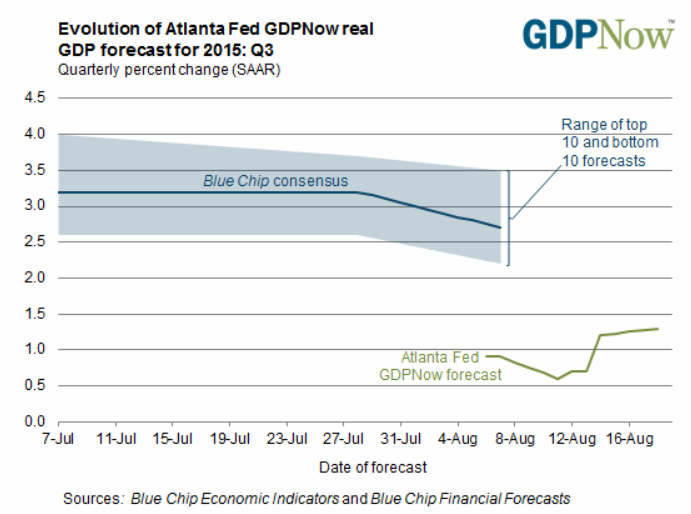 GDP growth averages just about 1% annually for three quarters. Not once in history has the Fed hiked with such anemic growth.